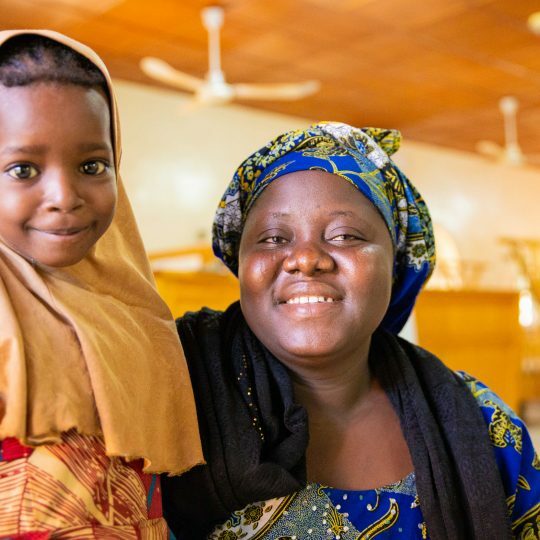 “What motivates me in my work is the team here and the fact that I am playing a part in transforming the lives of children and bringing healing to them. “Once there (was) a little girl who got a tumor, and it affected her body structure in that she stopped walking and couldn’t even sit. She had surgery, and we started physiotherapy. We worked so hard, and she started to improve, and as I speak the eight-year-old is now running all over the place and is very playful. Nothing gives me more satisfaction like when I see my patients back on their feet,” says Samuel Lwanga, the physiotherapist at CURE Uganda. 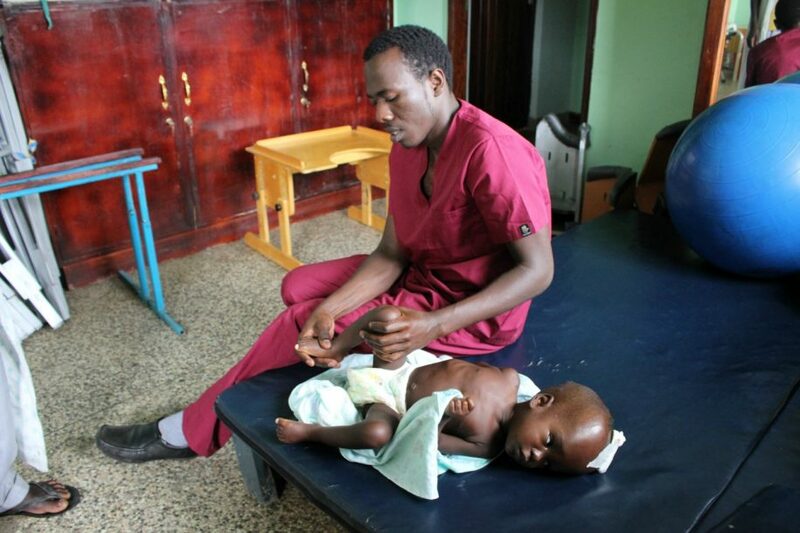 Sam believes that coming to CURE Uganda was his destiny. 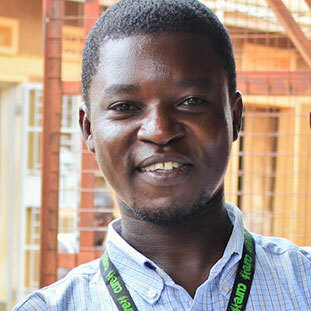 In 2013, shortly after he completed his degree, Sam responded to a CURE Uganda job advertisement for a physiotherapist, and he ended up getting the job. At first, he worked with Julie Johnson, Ph.D., a physiotherapist from the USA, but after she returned home, Sam managed the work by himself. His day starts in the ward (where he joins the rest of the medical team for ward rounds), and after that, he starts working with his patients. Patients wait to see Samuel (center). Physiotherapy student Mette, from Belgium, observes. Samuel also plays a pivotal role in teaching moms and older children about how their neuro conditions affect their body. He teaches them what they need to do to get better. 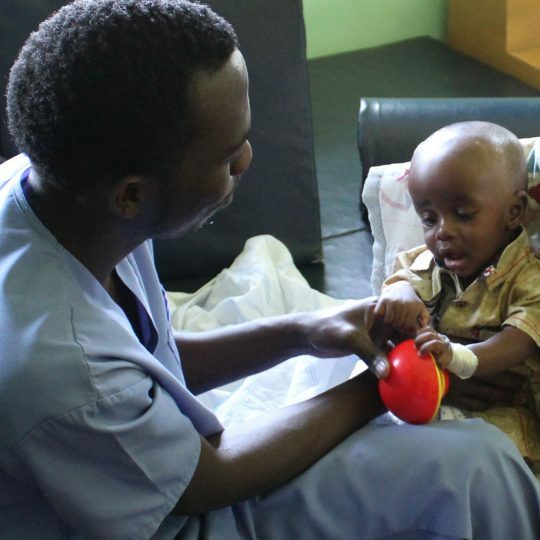 When Samuel is done seeing patients in the ward and ICU, he attends to his outpatients for the rest of the day. 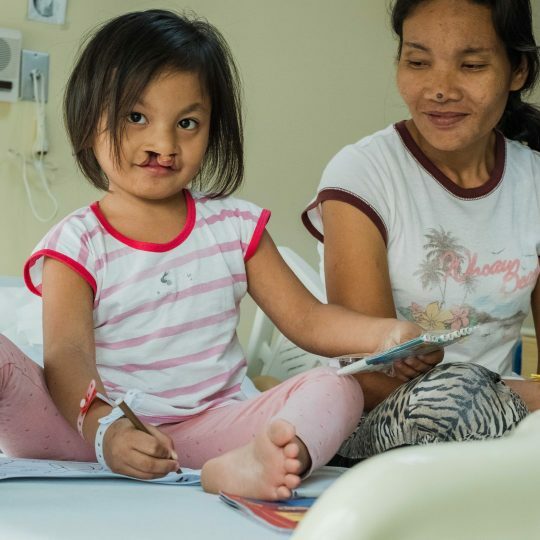 When he was still working with Julie, Sam was able to follow up with their patients in their homes and sometimes provide them with new supplies, like crutches. Now that he is on his own, the patients come and see him at the hospital. Baby Mary during pre-surgery physiotherapy. Sam helps our patients leave the hospital faster, and that helps CURE Uganda to free up space sooner so we can treat more kids. 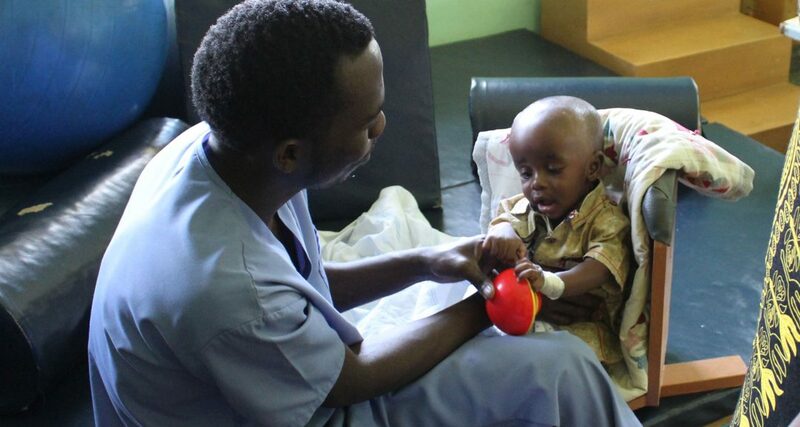 When patients are in ICU, Samuel performs mostly chest physiotherapy and positioning for faster recovery. 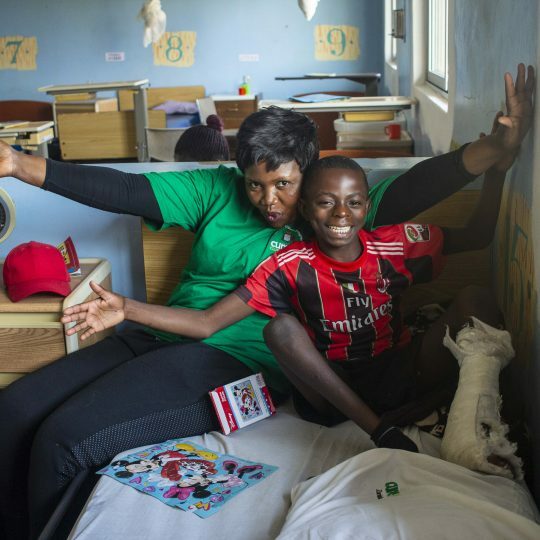 Blessing, a 14-year-old, is one of Sam’s regular patients. She can now walk to and from school! Blessing had surgery for spina bifida at CURE Uganda when she was just a baby, and now she is 14 years old, in primary six, and can now walk to school by herself. Whenever she meets with Sam, he gives her new exercises to add to her routine. 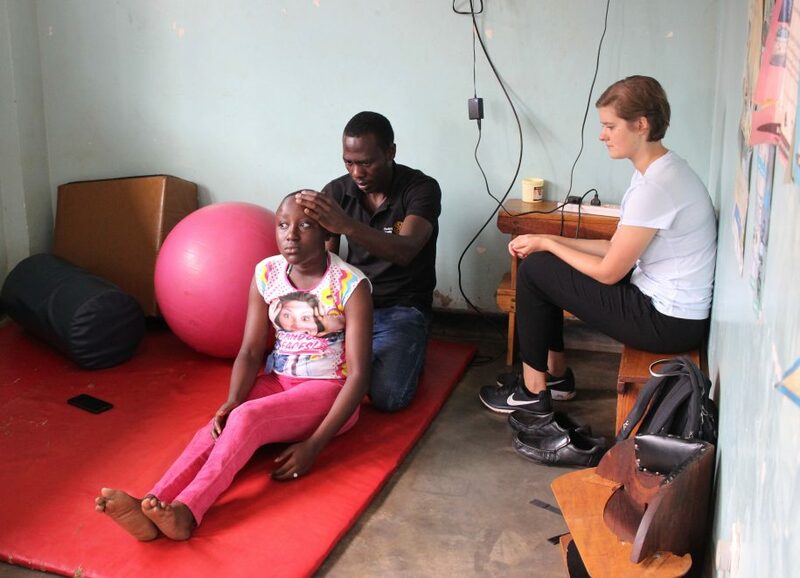 When Sam discharges patients, he gives them a home program with exercises to follow and sometimes a referral to a physiotherapist in the patient’s area. He always expects his clients to be ready for a more intense program when they return for a review. “Our goal is to improve the body function of our children and, in the end, improve their independence,” says Samuel. 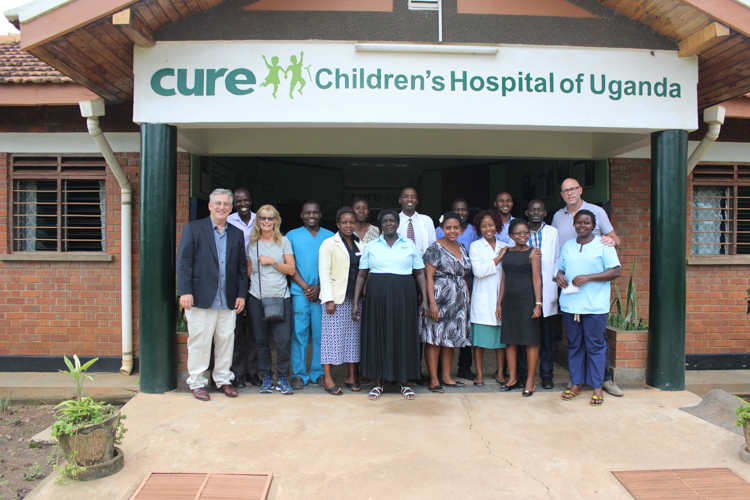 Thank you, Samuel, for your dedication to your patients and for the essential role you play at CURE Uganda! Edwin is a Storyteller at CURE Uganda.